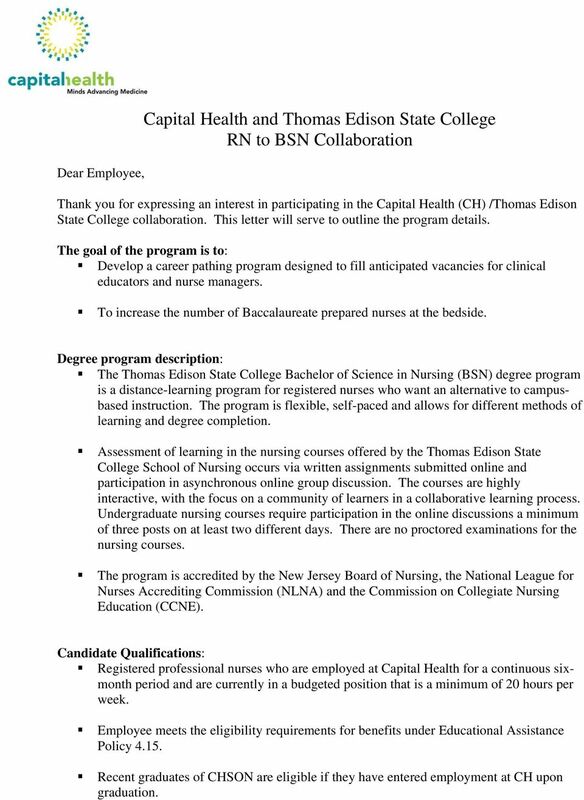 Download "Capital Health and Thomas Edison State College RN to BSN Collaboration"
1 Dear Employee, Capital Health and Thomas Edison State College RN to BSN Collaboration Thank you for expressing an interest in participating in the Capital Health (CH) /Thomas Edison State College collaboration. This letter will serve to outline the program details. The goal of the program is to: Develop a career pathing program designed to fill anticipated vacancies for clinical educators and nurse managers. To increase the number of Baccalaureate prepared nurses at the bedside. Degree program description: The Thomas Edison State College Bachelor of Science in Nursing (BSN) degree program is a distance-learning program for registered nurses who want an alternative to campusbased instruction. The program is flexible, self-paced and allows for different methods of learning and degree completion. 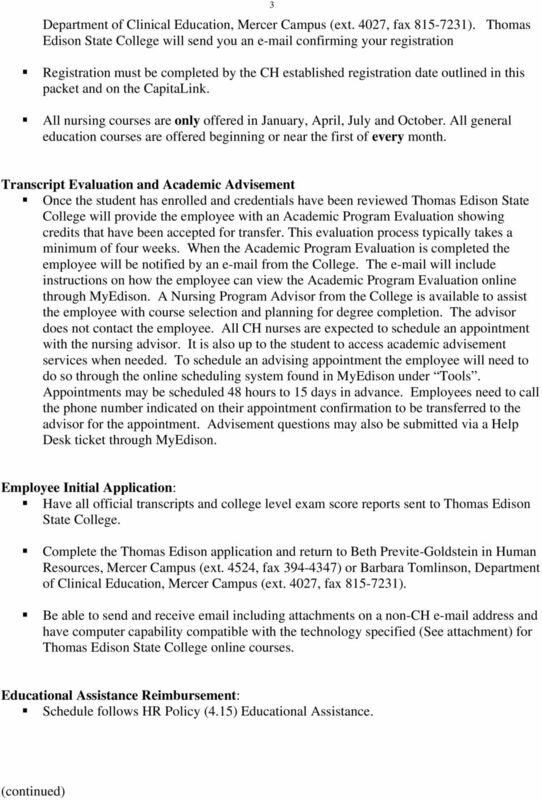 Assessment of learning in the nursing courses offered by the Thomas Edison State College School of Nursing occurs via written assignments submitted online and participation in asynchronous online group discussion. The courses are highly interactive, with the focus on a community of learners in a collaborative learning process. Undergraduate nursing courses require participation in the online discussions a minimum of three posts on at least two different days. There are no proctored examinations for the nursing courses. The program is accredited by the New Jersey Board of Nursing, the National League for Nurses Accrediting Commission (NLNA) and the Commission on Collegiate Nursing Education (CCNE). Candidate Qualifications: Registered professional nurses who are employed at Capital Health for a continuous sixmonth period and are currently in a budgeted position that is a minimum of 20 hours per week. 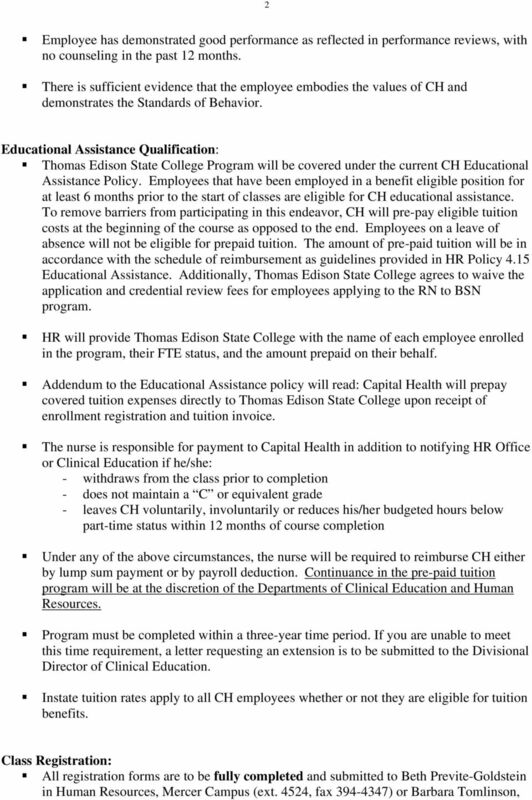 Employee meets the eligibility requirements for benefits under Educational Assistance Policy Recent graduates of CHSON are eligible if they have entered employment at CH upon graduation. 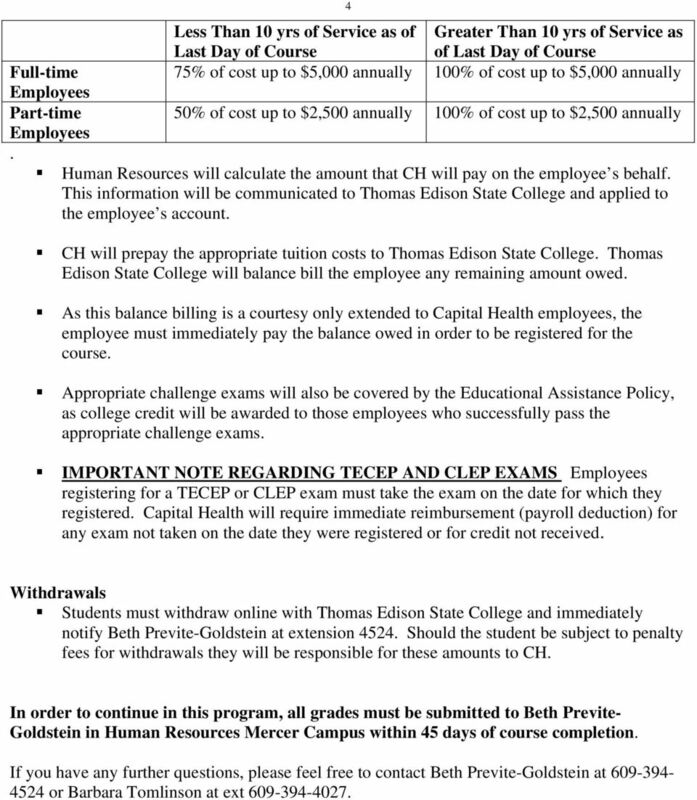 Capital Health and Thomas Edison State College RN to MSN Collaboration Dear Employee, Thank you for expressing an interest in participating in the Capital Health (CH) /Thomas Edison State College collaboration. FAQs for Accelerated Track. Q: Can I apply to the accelerated program while still taking the prerequisite courses? PROCEDURE: I. PURPOSE: To provide guidelines and procedures related to the awarding of Stockton credit for past education and learning experiences. The College of New Jersey s Master of Education in Educational Leadership:Instruction Offered in Partnership with the Regional Training Center 1. When can I apply for the TCNJ/RTC Master of Education? 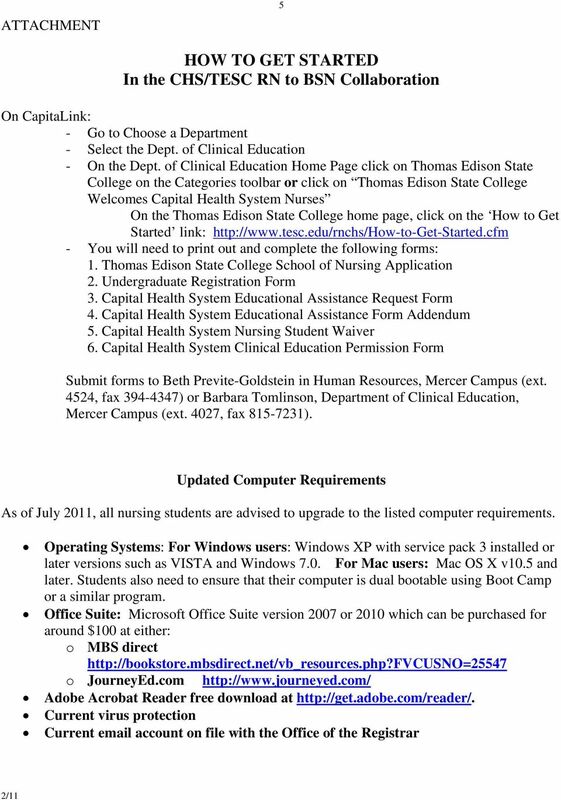 HENRY FORD HEALTH SYSTEM 2015 Nurse Tuition Funding Program Application Application Due September 14, 2015 PLEASE PRINT CLEARLY. (Last) (First) (M.I. The Citadel Veterans Service Office The Citadel Policies and Procedures for using VA Educational Benefits 10/21/2013 1 This guide will help you with maintaining your educational benefits through the Dept. School of Nursing Graduate Program Frequently Asked Questions for Prospective DNP Students. 1. What is the Doctor of Nursing Practice (DNP) program?